A lot of camera manufacturers are claiming a 'best ever' performance for their latest products, and the Canon PowerShot G1 X Mark II is no exception. But, for once, the hype may well be justified for this re-vamp of 2012's original Canon G1 X. The equation runs something like this: a physically large sensor married to a sizeable, high quality lens equals high quality images. In the case of the 'Mark II' we get a large 1.5-inch CMOS sensor – most compact cameras settle for a small 1/2.3-inch, so this is larger to APS-C DSLR size – plus a chunky piece of glass on the front offering an aperture range stretching from a bright f/2.0 (compared to its predecessor's f/2.8) to a still very respectable f/3.9, especially given that this is a zoom lens. Focal range stretches from 24mm to 120mm in 35mm terms, equivalent to a 5x optical zoom, a slight step up from the original's 4x zoom. Given the above we should be more than capable of achieving images with plenty of beautiful 'bokeh' – the terms given to the effect of a shallow depth of field whereby the key features of your subject are sharp but the surrounds are gradually blurred to add visual punch. The actual pictures themselves offer a maximum 12.8 megapixels – seems modest, but hey, size isn't everything – and are presented in a default 3:2 image ratio, a format that seems to be gradually taking over from the old 4:3 as the factory setting. Naturally there is video shooting too, at a resolution of 1920x1080 pixels at 30 frames per second (up from 24fps previously), and with stereo sound. A performance that is, in this way, similar to one that we'd get from a fully tooled up digital SLR will be a large part of the G1 X Mark II's appeal. We'd all like to get professional looking results, but don't want to carry a bulky camera with interchangeable lenses with us for every occasion. The G1 X Mark II is the kind of camera you can stash in your 'man bag' for when that photo opportunity presents itself. OK, so that's the good news, what's the bad? Well, from whatever angle we're approaching it from, £749 sounds like a lot of money for a 'compact' camera and is some £50 more than its forebear on release. That's exactly the same as what's being asked by the equally new Panasonic FZ1000, and that offers a one-inch sensor and 16x optical zoom, even if it is larger overall because of the extra lens power. So what else does the Canon offer to justify the outlay? Well how about dual lens control rings – something we haven't encountered before on a compact where one is the norm, if anything – thus further satisfying photographers who want the handling experience of an SLR yet in compact form. With rechargeable battery inserted this PowerShot model feels door stop-like solid too, thanks to stainless steel frame yet aluminium exterior, which is reassuring if you're considering buying this camera as the long-term investment its price tag suggests it is. Add on an improved AiAf system with 31 AF points, quite a step up from its predecessor's more standard issue 9-point AF and the only thing shallow about this camera is its achievable depth of field effects. But how does it handle in the real world? Though it may promise a DSLR-like experience, the controls on the G1 X Mark II will be immediately familiar to anyone stepping up from any other compact camera. We get a familiar bottle top style shooting mode wheel top right of the top plate, with 12 options to choose from mixing the usual auto and manual settings. A spring-loaded pop up flash with its own manual activation lever sits over at the other side of the camera, while between the two we find a covered vacant hotshoe for an accessory flashgun or optional Canon electronic viewfinder for eye-level shooting, and nestled right by the shooting mode wheel, a large raised shutter release button with surrounding zoom lever and on/off button situated just behind it. The attractively tactile dual lens control rings we mentioned in the introduction are also customisable. Just to differentiate them when you should have your eye on the subject rather than the lens, the one closest to the camera body is 'stepped' – i.e it clicks as it turns, while the other is continuous – i.e you twist it and it continues turning endlessly. We do get a dedicated button for recording video, but as it's tiny and placed in a narrow gap just right of the thumb pad on the rear plate, it's easy to overlook and perhaps a little more awkward to press than should be ideally. Most importantly though, thanks to a nicely rounded grip that it's a rarity to find on a compact camera when rivals seem hell-bent on producing the slimmest model possible, the G1 X Mark II feels good in the hand. It feels like a 'proper' camera should, for the cash being asked. The LCD on the back of the Canon G1 X Mark II is a capacitive touch screen. Not only that, but it can be pulled outward from the body and tilted upwards. In fact it can be tilted so far upwards that it can be flipped to face the subject in front of the lens. While we're sure most of the serious enthusiast target audience for this camera won't be buying this just for the ease of taking 'selfies', nevertheless the opportunity and means is provided. However, overall we preferred the screen on its predecessor that could be flipped out 180° to the body, as on a camcorder, thus enabling users to shoot surreptitiously around corners if wanted. While the screen has been re-imaged, there's no built-in eye level viewfinder this time either. Instead, as noted, there is also the opportunity to splash some extra cash on an eye level electronic viewfinder for this model, which can be fixed to the vacant hotshoe and tilted through 90° for eye level viewing. But that's another £250 or so. A lithium ion rechargeable battery and standalone mains charger come bundled with the Canon G1 X Mark II, allowing for 240 shots of regular, default usage or 300 images if switching the camera to eco mode. Therefore, it's not marvellous but it will do is probably the best way of summing up the power consumption on offer. A bright/fast f/2 aperture lens, twinned with a large-ish sensor and an ISO range stretching to ISO12800 make this a dream for those looking for better results when shooting handheld in low light. That also goes for Full HD video just as much as stills – plus, naturally in this being a premium compact there is the ability to capture uncompressed Raw files as well as compressed JPEGs. The widest aperture as we've noted also allows for attractively shallow depth of field shots where the nose or eyes are razor sharp and everything else is gradually blurred, giving a real 3D depth and lifelike quality to the Canon's images which is all we could really wish for. The pitch for this camera of DSLR-like performance yet compact portability, is that same one that most rivals make for their similarly priced compact system cameras upon which the lens in use can be swapped. 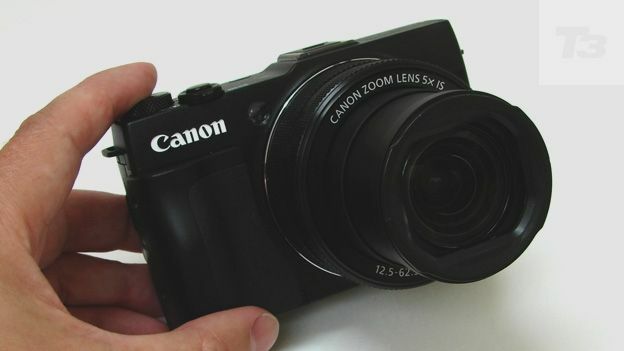 It's even the same one the maker made for its own – and so far only – system camera two years ago in the impressive Canon EOS M, which can now be picked up for considerably less than the G1 X Mark II's launch price. Arguably the latter will be the one that will be snapped up by those who don't want or need the ability to swap lenses, but want the best that an all-singing, all-dancing compact can offer. Luckily the G1 X Mark II in being Canon's new 'master compact' does come very close to delivering the best. A bigger sensor and re-imagined controls also ensure that this camera feels less like and update and more like a wholly new model in its own right.